With end-of-year report cards arriving in homes across the globe, many parents are thinking about how to reward their children for those high marks. A great question emerges: should I pay my child for good grades? My son got his report card last week. It was great one and we were proud of him. So my husband suggested we give him a bonus for his good grades (aka pocket money as he is 13). I was on the fence about it. What do you think: should I pay my child for good grades? Money is not a reward. It should be earned through work. Maybe I am too accountant in my thinking but getting good grades is not a job. What if your child works hard and does not get good grades. It happens. What message are you sending to your child? That hard work doesn’t matter unless you get the results we want? Good grades should not be rewarded. The reward is the grade and the hard work. I think if we reward good grades we may see a decrease of interest in school. For example, at 6, you promise him $5, at 7 year old, your child may want more money, etc. The older they get the smarter they get about money. So if at 12, you cannot afford to reward him what he wants, he may not want to work hard because he knows he won’t get what he wants. Reward= bribe (in my opinion). We should encourage the love of learning in children and not the love of working to get a reward from parents. Now I am not talking about NOT celebrating the report card and hard work. We usually celebrate the year end with a special treat for ALL the family members: we go to the movies, order their favorite take out. That’s different. Good grades and hard work is what is expected from kids to do. As parents are expected to raise their children, kids are expected to go to school and learn. Am I being paid for preparing food for my kids? What message am I sending to my child when I pay him for good grade: Pay you for something you are SUPPOSED to do? Bottom line: good grades and hard work should be congratulated and shared with the family friends. It helps with the self esteem and pride. There is no reason, however, that the reward needs to be monetary. What do you think? 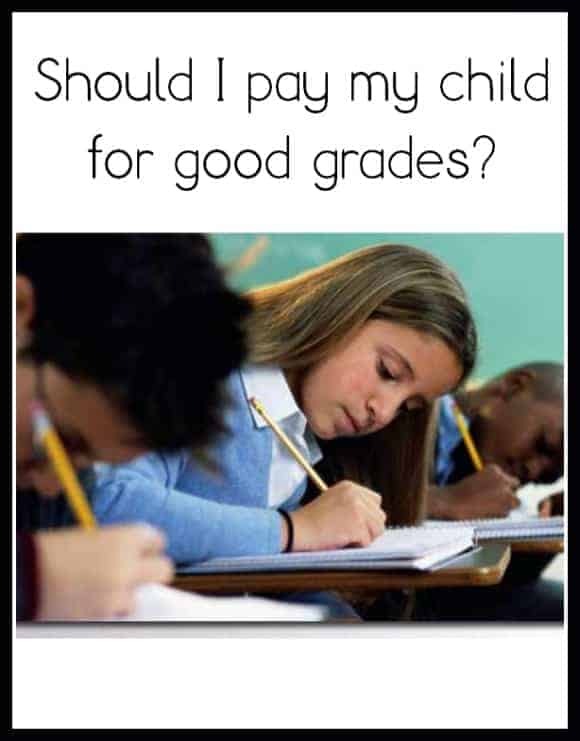 Should I pay my child for good grades? Do you pay yours? Should we use other types of rewards? I would like to hear from you about this in the comment section below. There’s a great book on this issue, Punished by Rewards by Alfie Kohn. Learning should be a lifelong process and rewards for learning can kill that innate love of learning in children. My son is still too young for school, but I’ll be honest, I’ve never thought about paying him before. My Grandpa always paid me $20! for an A. It definitely motivated me to work hard. If I worked hard in a class and din’t get an A, I wasn’t too bummed. I think I’m definitely going to have to have some kind of motivator for my son when he is older. Melissa, my grandpa used to pay me pretty well for an A too! I got about half that amount for a B. Anything below that didn’t get paid. As a homeschool mom I say yes! This will be the 1st year I will be grading, I think it shows what the child is retaining. I don’t necessarily believe you should but a reward would be nice. It is optional but as long as they are aware that hard work pays off with good grades and not dollars then its totally acceptable. My kids get $5 for every A they receive on a report card. For me, it’s rewarding them for the work they accomplished. However, I have no doubt that if I told them that they would no longer receive money, they would continue to earn those good grades. For them, the reward is intrinsic, but I choose to demonstrate my gratitude by giving them spending money. I don’t pay my children for good grades-it’s their job to get them in my opinion. I praise them and post about making the high honor roll etc. We talk it up-but pay them not my style. I didn’t pay my children for good grades but I don’t see anything wrong with it. There is a big difference between children and adults and encouraging them to put their best effort forward even when they are suppose to be doing it. I think it is up to the parent and what works for them. We recently decided that payment/reward for school work, meaning hard work regardless of grades will be rewarded. My husband and I figure that we work for money. That is our job outside of the house (or work from home in my case). But school is their “job” through college. Why not reward kids for what is truly their job. Chores are part of living in a household. Parents do chores and don’t get paid. We want to create more of a real-world, get paid for your “job” scenario. It really helps when they don’t want to do homework. They better understand that this is their job. Wow, that may be the longest comment I have left in a very long time. I agree with you on no money for good grades. Now, chores around the house, that’s another story. Your 13 year old’s only job is school and as long as he’s working hard that’s his reward. One thing I’d consider is starting a “car fund” as he gets closer to his teenage years. Payment for chores, gifts, etc could go into a car fund that you and your husband match for the purchase of his first car.